Walked up and down Daranjani. Wanted a chapatti table to stand the kettle on, something to drain the crockery, another plate (I’d broken one), and while out I also bought another CD. Went in to work to try and finish the "what’s on when" database. Left to meet Mohammed at 3:30pm. We took a daladala out to Fuoni (about 7km out of town) to watch a premiership football game – Small Simba vs Kipanga. I love the way at half time the teams come to their dugouts and sit on the pitch, but more curious still is when some of the fans go and sit in the dusty centre circle. After the game we bought some fruit, drank the milk of a young coconut (mandafu), and then travelled back to Mohammed’s district. By the "bus stop" was a meeting place (a kind of community centre?) where there was a fluorescent light and TV. There were maybe 30 people, some watching an international football game, others playing cards or bao…. 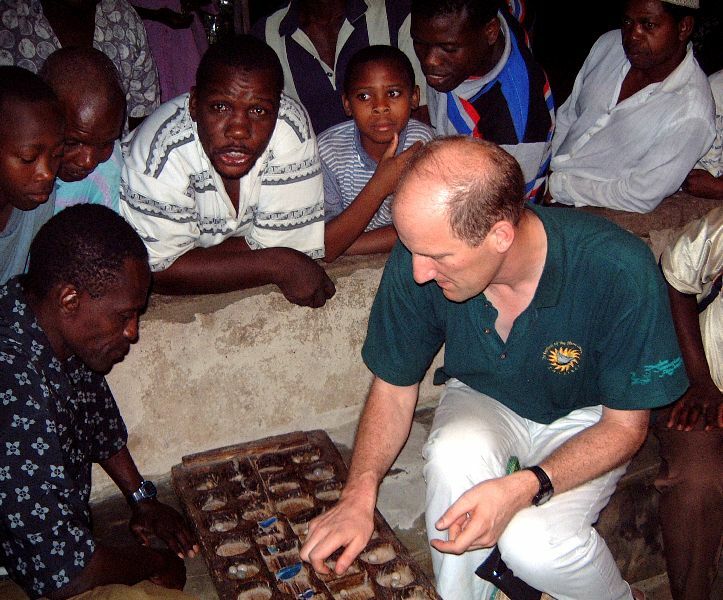 Mohammed wanted to pop home with the shopping so I waited for him and ended up playing bao with the locals – albeit the "children’s" version of the rules. 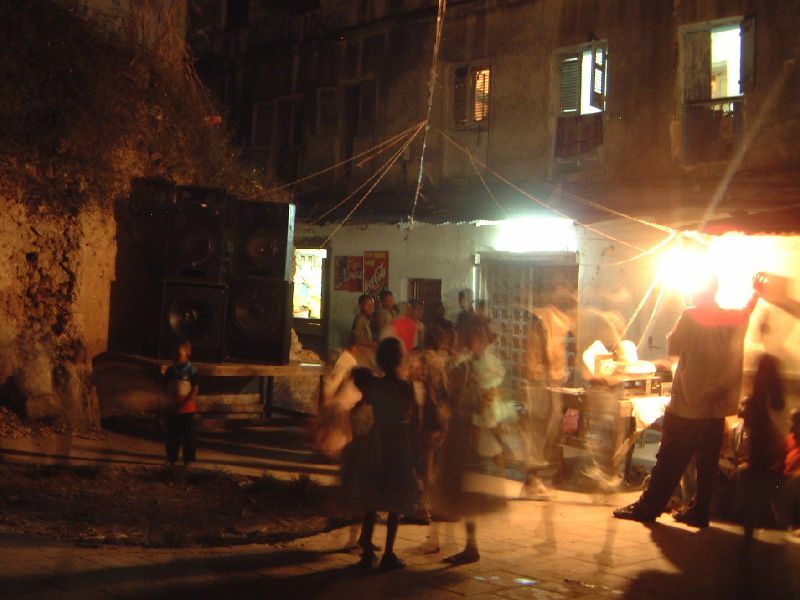 Later still, back in Stone Town I found there was a kids’ disco in an open area between some houses. A big sound system had been set up and everyone seemed to be having a jolly time. Had a tuna sandwich at home, then popped back into the office to try again to upload last week’s diary. Went across to Blues for a nightcap and found a party in full swing – enjoyed the last 20 minutes watching all the usually expats dancing their night away to "YMCA" and the like. Sunday afternoon the ZIFF minibus was going to Kiwengua, a fishing village on the other side of the island. Baretto and others needed to check out where to build a stage, outdoor cine screen, sound systems etc. Grabbed my swimming things and hopped on board. Although not the sunniest of days I couldn’t pass up on an opportunity to swim in the sea and enjoy a coffee at the Blue Bay hotel (when opened 3 years ago it was reputed to have the only cappuccino machine in the islands). Wahid popped into the office about 3:30pm. If I was interested Nlandege (top of the Premiership) were playing at Mau at 4:30pm… I’d been in the office since 8am and hadn’t stopped for lunch – too right I’d be interested. Finally went for a run. Out of town towards the open space where fishermen mend nets and everyone else (it seems) play football, then onto the beach and further still – turned around after 20 minutes and made my way back all the way along the beach including the stretch in front of State House where the "do not" signs are in Swahili. In the evening I went out to Mtoni Marine (5km out of town) for the "Splash Party" that had been advertised all over town. Around a swimming pool were arranged a disco – DJ Yusuf playing lots of great Africa music and about half of it in Swahili - a BBQ, a long table with all the expats on it and several more tables for the occasional tourist. As the evening went on the dance floor filled and all in all a good time was had. I had arranged for the taxi driver who took me to return at midnight which saved the "how to get home" hassle and was in bed by 1am.